CNN) -- North Korea said Saturday it would strengthen its nuclear capabilities, a defiant protest against the U.N. Security Council's move to tighten sanctions against it. 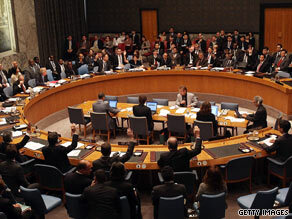 The U.N. Security Council votes for a resolution imposing sanctions against North Korea on Friday. North Korea officials said they were enriching uranium and would weaponize all plutonium, according to KCNA, the state-run North Korean news agency. When enriched to a high degree, uranium can be used for weapons-grade material. Plutonium can be used in atomic bombs. These moves are in response to Friday's U.N. resolution, according to the news agency, which referred to the resolution as a blockade. "No matter how hard the U.S.-led hostile forces may try all sorts of isolation and blockade, the DPRK (Democratic People's Republic of Korea), a proud nuclear power, will not flinch from them," KCNA said. The 15-0 vote on U.N. Resolution 1874 imposes an embargo on the shipment of arms from the communist regime and broadens a ban on the import of weapons. The resolution comes amid rising tension surrounding North Korea, which recently conducted a nuclear test, fired test rockets and threatened United States and South Korean ships near its territorial waters. The nuclear test and the firing of six short-range rockets occurred in late May. The resolution strengthens provisions already in U.N. Resolution 1718, passed in 2006. But there are also new provisions in the resolution, said Susan E. Rice, U.S. ambassador to the United Nations. The new resolution requires states to "exercise vigilance" over the direct or indirect supply, sale or transfer to North Korea of small arms or light weapons. Nations would be required to notify the sanctions committee at least five days prior to selling, supplying or transferring small arms or light weapons to North Korea. The resolution calls on all states to inspect vessels suspected of containing contraband. If a ship refuses, it is to proceed to the closest port for a mandatory inspection. A new regulation would prohibit nations from providing bunkering services, such as fuel, to North Korean ships believed to be carrying contraband. The draft also broadens authority to prevent the flow of funds that could benefit North Korea's missile, nuclear or proliferation activities. Late last month, two Defense Department officials said U.S. satellite imagery spotted "vehicle activity" at a North Korean ballistic missile facility. The officials said the images showed vehicles used to transport Taepodong-2 missiles, but no missile parts. The Taepodong-2 is a long-range missile North Korea tested in April. This week, a U.S. official who was not authorized to speak on the record told CNN that Washington had "indications" that North Korea may be planning another test. The official would not provide any details, however. U.S. President Barack Obama's special envoy to North Korea, Stephen Bosworth, called "simply groundless" accusations by Pyongyang that its nuclear and rocket tests were in response to American aggression. Washington officials have said the United States' goal is for North Korea to return to nuclear negotiations with the United States, China, South Korea, Japan and Russia, known as the six-party talks.